Click…click…click…go the knitting needles. The sound is a nostalgic one, bringing back memories of Grandma in her rocking chair. A captivated child sitting at her feet with the treasure of a loosely-wrapped peppermint from her pocket, listening to the cherished stories of a life well-lived. Over the years, the uses of yarn have become much more diverse and range from afghans to art. 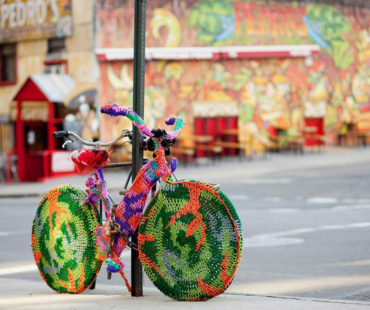 In the last decade, knitters, crocheters, and beyond have found creative ways to use their leftover yarn by taking their creations to the streets. 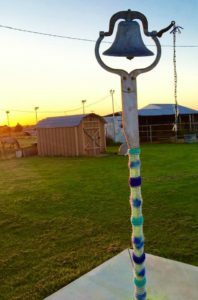 Yarn bombing, urban knitting and granny graffiti are just a few names for the art of colorful knitted and crocheted displays in public gathering places. While these installations can last for years, they are considered non-permanent and, unlike other forms of graffiti, can be removed. Expressive and decorative, yarn bombing began in an effort to redeem and personalize cold and lifeless public areas. Magda Sayeg, a boutique owner in Houston, Texas, is credited with pioneering the art revolution. A simple, custom-made cozy for a common doorknob in 2005 was the spark that ignited a worldwide fire. This tiny creation attracted attention from hundreds of passerby, inspiring Sayeg to venture further with the idea of covering objects with yarn. While Sayeg’s plunge into yarn bombing was accidental, she has spurred an entire global community of bombers. One of her first recognized works is a charming, widely-known transport bus in the heart of Mexico City. Other cited installations are recorded from Europe to Australia, there’s even a few in rural Montague County. Jan Browning, resident of Bowie, Texas, says she has witnessed many artful displays in her travels over the years. 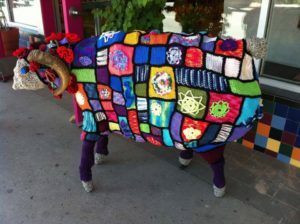 Making an impression was a vividly-hued sheep on the streets of Taos, New Mexico. Sensational spectacles such as this are what inspired her to adorn a generations-old dinner bell that continues to stand on her property, in the brilliance of Texas sunsets. 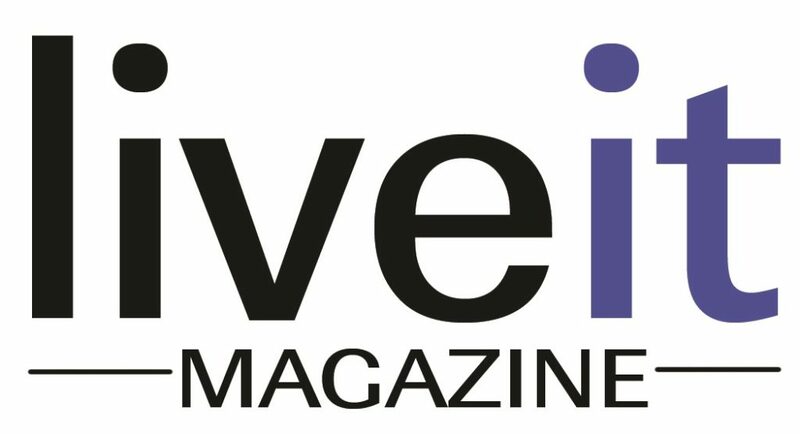 “I love being involved in any artistic endeavor that is playful and fun,” says Browning. Five talented ladies in Essex, England share the same love of yarn art as Browning. Their mutual affection for yarn crafts brought them together and consequently birthed The Craft Club Yarnbombers. In 2014, they became the Guinness World Record holder for the largest display of crochet sculptures when they yarn bombed a children’s hospice with 13,388 crocheted items. Yes, there is such a record. Over the years, with the help of community members, their projects have dramatically increased in size. 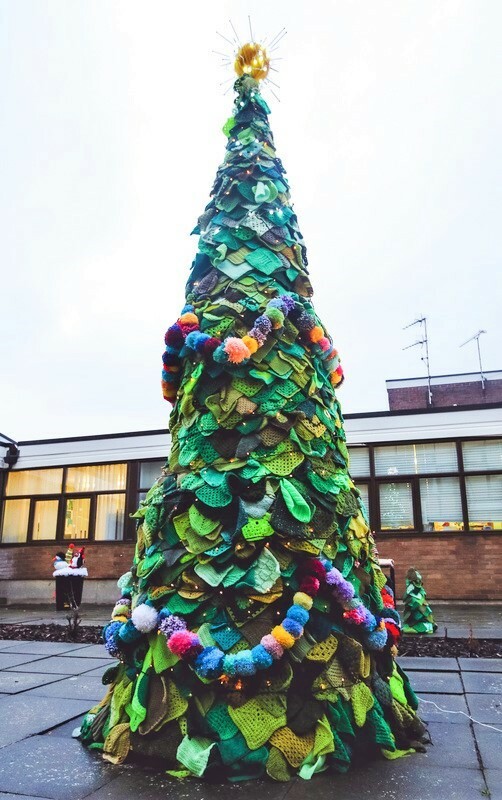 Merry Stitchmas began in 2015 with a goal to knit a 13 foot Christmas tree and place it in the courtyard of a local school. 1,843 squares were received from all over the world, a magical display of the fiber that is weaved through the hearts of many. 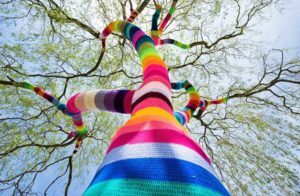 Much like the practice of knitting or crocheting, there are many factors to consider when yarn bombing. Selecting a “mark”, taking careful measurements, selecting your pattern or design and acknowledging the weather elements of each location. Many “taggers” like to remain anonymous but some include a calling card, sharing their story and inspiration for the piece. Yarn bombers are aware of the risk, in some areas this style of graffiti is still considered illegal. This hasn’t discouraged the masses but instead, it has sparked a Take Responsibility For Your Art campaign to encourage yarn bombers to maintain their installations. No matter the reason, the result of every handmade creation is beautiful to the beholder. The next time you see strands of yarn, in a sweater or on the street, take a moment to pause. You just might be transported back to the creak of a rocking chair and the click…click…click of Grandmother’s needles. 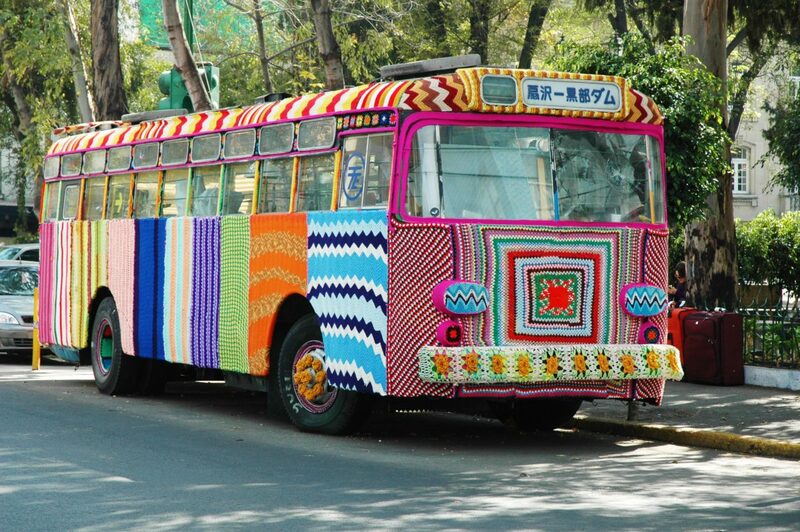 International Yarn Bombing Day was established in 2011 as an annual event, occurring the second Saturday of June.